Mr. Trump’s latest Travel Ban has been found unconstitutional. The 4th Circuit upheld a Maryland District Court’s injunction in a 9-4 decision. The 4th Circuit ruled against the Travel Ban on the basis that the policy was a product of “animus toward Islam.” The majority argued that Mr. Trump’s statements during the 2016 election were evidence that Mr. Trump was unjustly discriminating against Muslims. The dissent believes that the Judiciary should only examine the official reasons given by the administration instead of the statements given by the President before the election or on Twitter. The 4th Circuit had declared the first version of the Travel Ban unconstitutional in May 2017. The Ninth Circuit struck down the second version in December of 2017, for similar reasons. The 4th Circuit’s decision in May 2017 and February 2018 focused on discrimination against a religious minority. The Supreme Court removed the injunctions and is set to hear cases against the Travel Bans this April. 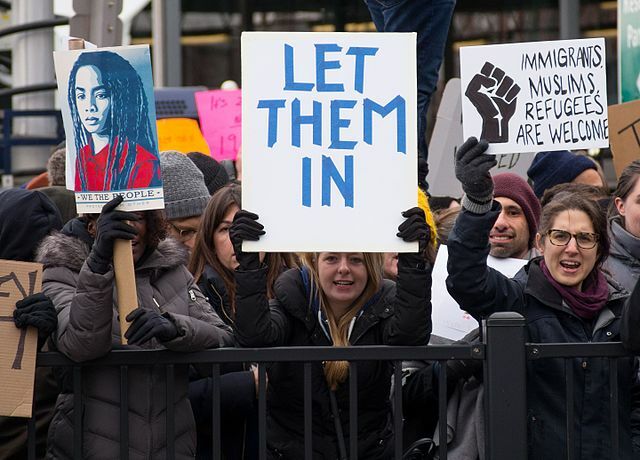 The majority found the Travel Ban unconstitutional because the intent behind it was an “animus toward Islam.” Such a determination would prevent Mr. Trump from ever enacting a Travel Ban during his time in office, but would not preclude a future President from enacting a similar ban. If a President Oprah Winfrey or President Kid Rock wanted to enact a Travel Ban, this court’s decision would not bar our new celebrity President from doing so. Interestingly, the dissent did not dispute that Mr. Trump has an animus towards Islam. Presumably, the 45th President’s remarks in speeches and on Twitter speak for themselves: “Study what General Pershing of the United States did to terrorists when caught. There was no more Radical Islamic Terror for 35 years!” or calling for a “total and complete shutdown of Muslims entering the United States.” The statements are somewhat ambiguous, since each statement apart could be about fighting radical Islamic terrorism. Nevertheless, it is telling that dissenting judges and government lawyers would prefer not to fight over the details. Instead, the argument has been whether Mr. Trump’s statements are legally relevant. The majority believes they are, since they are evidence of the Executive Branch’s ill intent. The dissent claims they are irrelevant and that such scrutiny is beyond the court’s purpose. A big flaw with the dissent’s argument is that this President constantly blurs his personal and his professional life. The President lets his sons handle his business organization instead of putting it into a blind trust as other Presidents have done. He lets his daughter attend meetings with foreign leaders and gives his son in law access to classified information even though said relative doesn’t have permanent security clearances. He also uses both his personal Twitter account and his official Presidential Twitter Account to make statements regarding policy. The White House and the DOJ have insisted that the President’s Twitter statements are official statements. Anything that comes out of the President’s Twitter account is an official statement regarding policies that the White House promotes, even if the Twitter rants contradict or harm the creditability of statements made by other Executive Branch officials. The dissent is also wrong in asserting that courts will use any contradictory statements to “strike down executive action it disagrees with.” This President is unique. Mr. Trump chooses to engage in behavior that would harm policies he promotes. No President has repeatedly shot himself in the foot like Mr. Trump has. If judges penalize Mr. Trump for saying contradictory and short-sighted things, then that is this President’s problem, not the courts. Furthermore, judicial demand that Presidents think before they speak or act is a good thing. If a President contradicts his own staff, then either the President is lying to the public or the state attorneys are lying to judges. Since judges must be fact finders before making a decision, Executive branch dishonesty impedes the judiciary from serving its proper function as arbitrator of the law. If state attorneys plan to argue that a policy is for national security, they should communicate with their boss to stick with the plan or risk losing. The notion that discriminating against Trump is unconstitutional is absurd. The judiciary must determine if a policy is consistent with the constitution. If the Executive cannot give the judiciary consistent answers, then the policies must be suspect until the Executive can explain itself. The President should either change his behavior or expect his own power to wane. No other President has faced institutional challenges like this because no other President acts like this. Neither the judiciary nor the public should bury its head in the sand. How is the Trump Administration Responding to the Zero-Tolerance Approach Aftermath?